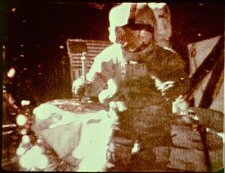 May 18, 2007: Standing on the Moon in 1971, Apollo 15 astronaut Dave Scott held his hands out at shoulder height, a hammer in one hand and a feather in the other. And as the world looked on via live television, he let go. It was an odd sight: the feather didn't drift to the ground, it plummeted, falling just as fast as the hammer. Without air resistance to slow the feather, the two objects hit moondust at the same instant. "What do you know!" exclaimed Scott. "Mr. Galileo was right." Scott was referring to a famous experiment of the 16th century. Depending on who tells the story, Galileo Galilei either dropped balls from the top of the Leaning Tower of Pisa or he rolled balls down slopes at home. Either way, the result was the same: Although the balls were made of different materials, they all reached bottom at the same time. Today, this is known as "the equivalence principle." Gravity accelerates all objects equally regardless of their masses or the materials from which they are made. It's a cornerstone of modern physics. 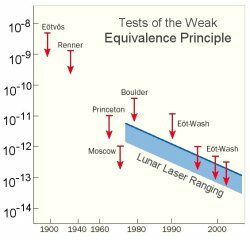 But what if the equivalence principle (EP) is wrong? Galileo's experiments were only accurate to about 1%, leaving room for doubt, and skeptical physicists have been "testing EP" ever since. The best modern limits, based on, e.g., laser ranging of the Moon to measure how fast it falls around Earth, show that EP holds within a few parts in a trillion (1012). This is fantastically accurate, yet the possibility remains that the equivalence principle could fail at some more subtle level. "It's a possibility we must investigate," says physicist Clifford Will of Washington University in St. Louis, Missouri. "Discovering even the slightest difference in how gravity acts on objects of different materials would have enormous implications." In fact, it could provide the first real evidence for string theory. String theory elegantly explains fundamental particles as different vibrations of infinitesimal strings, and in doing so solves many lingering problems of modern physics. But string theory is highly controversial, in part because most of its predictions are virtually impossible to verify with experiments. If it's not testable, it's not science. The equivalence principle could offer one way to test string theory. "Some variants of string theory predict the existence of a very weak force that would make gravity slightly different depending on an object's composition," says Will. "Finding a variation in gravity for different materials wouldn't immediately prove that string theory is correct, but it would give the theory a dose of supporting evidence." This new facet of gravity, if it exists, would be so astonishingly weak that detecting it is a tremendous challenge. Gravity itself is a relatively weak force—it's a trillion trillion trillion (1036) times more feeble than electromagnetism. Theorists believe the new force would be at least ten million million (1013) times weaker than gravity. Just as magnetism acts on objects made of iron but not plastic, the new force wouldn't affect all matter equally. The force's pull would vary depending on what the object is made of. For example, some versions of string theory suggest that this new force would interact with the electromagnetic energy contained in a material. Two atoms that have the same mass can contain different amounts of electromagnetic energy if, say, one has more protons, which have an electric charge, while the other has more neutrons, which have no charge. Traditional gravity would pull on both of these atoms equally, but if gravity includes this new force, the pull on these two atoms would differ ever so slightly. No experiment to date has detected this tiny difference. But now three groups of scientists are proposing space-borne missions that would hunt for this effect with greater sensitivity than ever before. "What you want to do is take two test masses made of different materials and watch for very small differences in how fast they fall," Will says. "On Earth, an object can only fall for a short time before it hits the ground. But an object in orbit is literally falling around the Earth, so it can fall continuously for a long time." Tiny differences in the pull of gravity would accumulate over time, perhaps growing large enough to be detectable. One test mission, called the Satellite Test of the Equivalence Principle (STEP), is being developed by Stanford University and an international team of collaborators. STEP would be able to detect a deviation in the equivalence principle as small as one part in a million trillion (1018). That's 100,000 times more sensitive than the current best measurement. STEP's design uses four pairs of test masses instead of just one pair. The redundancy is to ensure that any difference seen in how the test masses fall is truly caused by a violation of the equivalence principle, and not by some other disturbance or imperfection in the hardware. "When trying to measure such a miniscule effect, you have to eliminate as many external disturbances as possible," Will explains. STEP's design places the test masses inside a large tank of liquid helium to insulate them from external temperature fluctuations, and surrounds the masses with a superconducting shell to shield them from magnetic and electrical interference. Microthrusters counteract the effects of atmospheric drag on the orbiting satellite, making the free fall of the test masses nearly perfect. In this pristine environment, each pair of test masses should stay perfectly aligned with each other as they fall around the Earth—that is, if the equivalence principle holds. But if this new component of gravity does exist, one test mass will fall at a slightly different rate than its partner, so the pair will drift slightly out of alignment over time. Currently, STEP is still in the design phase. 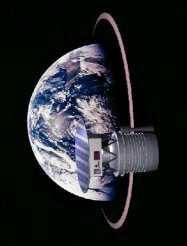 Another satellite-based experiment, the French-developed Micro-Satellite à traînée Compensée pour l'Observation du Principe d'Equivalence (MICROSCOPE), is scheduled to launch in 2010. MICROSCOPE will have two pairs of test masses instead of four, and will be able to detect a violation of the equivalence principle as small as one part in a million billion (1015). The third experiment is the Italian satellite Galileo Galilei ("GG" for short), which will operate in much the same way as STEP and MICROSCOPE, except that it uses only one pair of test masses. To improve its accuracy, the Galileo Galilei satellite will spin about its central axis at a rate of 2 rotations per second. That way, any disturbances within the spacecraft will pull in all directions equally, thus canceling themselves out. The experiment should be able to achieve a sensitivity of one part in a hundred million billion (1017). Whether any of these missions stand a chance of detecting a violation of the equivalence principle is hard to say. Will says that he expects the experiments won't find any deviation, in part because finding one would be such a major revolution for modern physics. And string theory makes a range of predictions about how strong this new force would be, so it's possible that the effect would be too small for even these space-borne instruments to detect. Finding no deviation would still be helpful: it would rule out some variants of string theory, inching physicists toward the correct "Theory of Everything." But finding a deviation, however small, would be a giant leap. Note: The equivalence principle discussed in this story is now referred to by physicists as the "weak equivalence principle" or WEP for short. In 1907, Einstein formulated a more comprehensive strong equivalence principle (SEP) for his General Theory of Relativity. The WEP is a subset of the SEP. The home page of Clifford M. Will -- professor of physics at the University of Washington; President of the International Society on General Relativity and Gravitation; member of the National Academy of Sciences. The legend of the leaning tower -- Historians are not sure if Galileo ever carried out experiments at the Leaning Tower of Pisa. So why, asks Robert P Crease, has the story become part of physics folklore?